DENSO Corp. unveiled its newest satellite R&D team in Israel, accelerating advanced technologies like automated driving, cybersecurity and artificial intelligence (AI). Starting in April, DENSO’s R&D satellite will begin collaborating with local startups to pioneer new technologies. 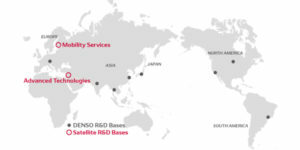 This is the newest satellite in DENSO’s global R&D network located in key regions. DENSO recently announced an initiative to broaden R&D capabilities outside Japan, and in 2017, started satellite R&D activities in Helsinki, Finland, focusing on creating advanced technologies and services. The company distributes cutting-edge R&D functions around the world and works with local universities, research institutions, startups and various other partners to develop competitive products and technologies tailored to customers and regional characteristics. DENSO’s satellite R&D activities in Israel build on the country’s surge in innovative technologies in fields spanning cybersecurity, telecommunications, AI, sensing and software. Israeli companies and tech startups have an established track record for successful collaboration with companies overseas, and are expected to play a major role in global innovation across a number of fields.